It's Tuesday around 2pm here in Nanchang. It's cloudy and rainy and not so hot, hooray! June Bug is sleeping, so I will show you our day so far in pictures. First of all, after blogging at 1am last night, I fell fast asleep. The Bug woke up at 5am, but Daddy fed her a bottle in the bathroom so I could continue sleeping. Buggie then went back to sleep. I woke up experiencing the worst day of my cold- you know the constant sneezing, runny nose fun, so I was grateful for the sleep. He's such a great dad! I'm hopped up on cold medicine right now, so I'm feeling a bit better. 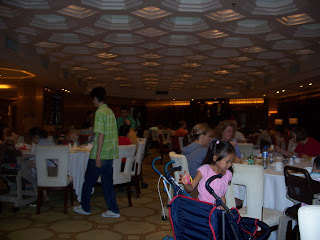 We began our morning at the breakfast buffet, which is included in our room fee. No dumplings today! That's probably a good thing. People thought I'd lose weight in China? Do you know how good the food is here? MMMMMM gimmeeee mooooore! June Buggy loves to eat. 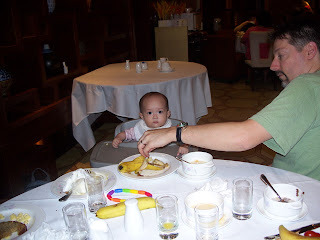 She especially loves congee with meat, bananas, banana bread, moon cakes, and well... anything and everything. She loves food! Just like mama. It was suggested by someone in our travel group that perhaps I wear a mask today or perhaps not partake in the social activities. The mask was a no no. I'm trying to bond with a baby, not scare the crap out of her. I stopped by our guide's room and told her of my situation. She said, 'No way, come along! 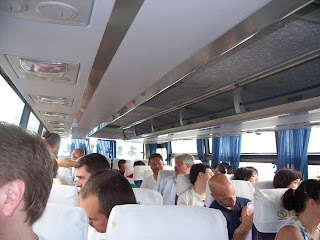 Sit in the front of the bus and have fun with us!" Here is the group in the hotel lobby, getting ready to board the bus for our morning activities. Word must have got around that I was under the weather. When one of the husband's got on the bus, he said, "I hear you're sick." My reply, "As long as you don't touch me or make out with me, you'll be just fine." So far the adults in our group have had one case of an extreme migraine, three food poisonings, and one cold. I'd say we're doing good so far! Here's us on the bus. The plan was to go to a local park, then go to Walmart. It had just stopped raining, but we had a bus full of babies ready to go down for their 9am naps. Those with babies asked to skip the park and go to Walmart instead. Those without wanted to go to the park. It's very hard to please people in a group situation. We knew we had about one hour of nap time to do shopping without babies waking up and needing bottles. Walmart won. All the babies in this group are so young, so those morning naps are very important to keep baby happy until the next nap. Plus, our babies were fed quite often. June Bug gets a bottle every four hours. Quite unusual for an 8 month old. Making a bottle on the side of the road or in moving bus is challenging. Especially since the babies like hot water from a thermos. There's a lot of mixology going on. Ok, so Walmart! Walmart in Nanchang is two stories tall. You enter through a mall area that sells cheap trinkets. Then into Walmart you go. The top floor had the baby items. Our group headed for the diapers and like sheep, we all grabbed the same diapers. Bad move. Turns out we bought pull ups. ARRG! 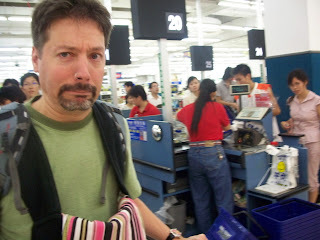 The prices at Nanchang Walmart are about 1 dollar cheaper than any Walmart in the USA. The clothing is much worse quality, so I did not buy baby clothes at Walmart. The downstairs area was interesting. That's the food area and it's loaded with really unique items. Like the eels on ice! You know what really shocked me about Walmart? 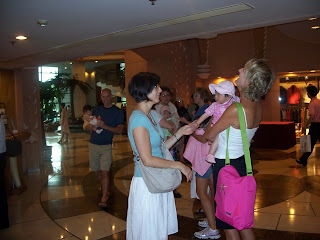 Here's what happened to our blonde travel mates. They were followed from aisle to aisle. People wanted to take pictures and hold their babies. Some even just grabbed the babies from the arms without asking. Big fusses were made over these babies. And here's what happened to Matt and I. People stared. They pointed. They frowned at us. They pointed at our baby and shook their heads and frowned some more. We'd smile and say Ni Hao, but they'd turn their heads and walk away. And that happened in every single section of the store. I finally tuned them out. 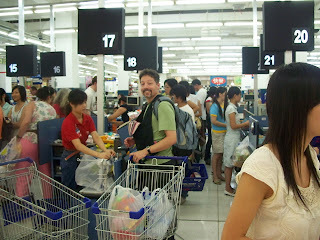 In the check out lane, we were approached by high school girls who spoke English and wanted to know where we were from. "USA? Oh USA, that's great! Such pretty baby!!" So I have no clue why the others were unhappy with our presence. I've heard theories that they feel envious of the baby getting to leave for a better life. Or maybe I was just too fat for their tastes or Matt's nose ring was too freaky for them. Who knows. We did get everything on our list, including June Bug's beloved Moon Cakes. Oh how she loves Moon Cakes. Walmart in Nanchang was an hour of my life I never want to repeat. It was really hot, not too crowded, but the crowd was not friendly to us. They weren't hostile, they were just not thrilled we were there. This is Matt, giving me a look that we had been given while shopping. We were getting back to the bus when Mary, our guide, said, "We're going to stop at Mcdonalds so you can get some lunch." We laughed and said, "Mary, we don't even eat Mcdonalds in the USA. Can you suggest a good Chinese restaurant for us?" She was impressed with us. "You are embracing our culture, this is good! We have such good food! I will organize a dinner for us tonight at authentic Chinese restaurant." Our driver parked illegally so the travel mates could get Mickey D's. An unhappy motorist banged on the bus door and began shouting at the bus driver. This carried on for several minutes while those of us on the bus got worried. The dude outside was PISSED! We thought for sure it was going to escalate into something major. But it didn't. Because it's China. If it was the US, there would have been a fist fight or worse. After getting back to the hotel, Matt and I packed up June Bug in her carrier and tried out the restaurant's lunch buffet. It was entirely Eastern. OH it was AMAZING. The only downside is smoking is allowed in the restaurant. A sweet host tried to seat us away from the smoke. "You have baby, smoke is no good for baby." Then he cast an evil glance at a woman smoking next to her newly adopted Chinese baby. Smoking with one hand, eating with the other hand. I had (and you are going to freak when you hear this) a plate of squid, tofu, jellyfish, and assorted green veggies over clear noodles. OH MY GOSH. Fantastic. And I better not get sick from this food because then people will go, 'SEE! You should have eaten the Mcdonalds instead!" June Bug is a completely different baby today and not in a good way. She has shut down emotionally. I've read up about attachment phases and it seems normal. Maybe someone can help with this. She's very very clingy with us, but not smiling and not interested in interacting with us. She'd crawl into us if she could, but doesn't really want to look at and refuses to smile. She doesn't seem down, just scared. Not of us. She is TERRIFIED when any Chinese woman approaches her. Our guides came in to visit us in our room and Juna became hysterical and clawed at me to get her away from them. When the hostess at the restaurant wanted to touch her cheek and sing to her, Juna buried her face into Matt's shoulder and whimpered. She seems fine when when other Caucasians talk to her. But Asians? No. My thinking is that she is bonding with us and feels anyone Asian is from the orphanage and is ready to take her away from us. She doesn't seem to be mourning anyone from the orphanage at all. She does get very concerned when she hears another baby crying. To the point that she will almost fly off our laps to try to find the crying baby. She also gets angry with us- like when we change her diaper (she hates that) and will not look at us or want to be near that person for a few minutes. Then she wants to crawl into our arms and not let go again. When she's really scared, she claws at us or at herself. It's so sad to see that. The poor baby is so confused. My heart breaks for her. Even tho I came all this way to get her, I am part of why she is going through this. The emotions- wow, so hard to process. From what I have read, tomorrow will be the day she will come out a bit more. I'm not concerned, since it's obvious she has attached to us and does not want to go back where she came from. I'd just like to see some smiles and more trust of us. That will come in time. Just curious if her fear of Asians is normal? Am I right about my theory? Any suggestions or advice from those who have been there? I hope this entry doesn't seem down or negative. I am trying to be as honest as possible about this experience and not gloss over my emotions. You think, "I'm going to be so grateful when I'm there, none of those things will bug me." When you're here and you're living this, it's a completely different ballgame. This is such an emotional experience. You never know how you will react from day to day. Today, I am worried about my Buggy Girl. I just want her to know we love her so much. It's hard to go through this while also missing my lovelies back home. Thank goodness for Matt. Again, I say that. Matt is getting me through the emotional times. He's so good with Juna. It shows in how much she wants to be with him. Ok- any BTDT advice or insight for me?? Until 1am, cuz you know I'll be here blogging at 1am!! When can you bring her home?! I think she needs home, ya know? You know, reading this blog has made me cry a few times. :) Anyway, it sounds to me like she's a smart kid and somehow she's gone from being happy to remembering the orphanage and she's scared to go back. She wants to stay with you guys, but she doesn't know what's going to happen next.. Hell, it would make *me* moody if I were in here shoes. Poor little Bug. I showed Grace her picture and she said, "Awww, she's so beautiful." And she is. You're a lucky, lucky family. 1. Does she mind being touched - even if she does keep after her. I would rub S. down every night after her bath with baby lotion. I found the lavender kind in CHina and used that. Remember the baby massage class we had? 2. Huge bonding steps were made when I took a bath with her and held her on my chest in the tub. I know you know all of this already. 3. We played with band aids - I let her stick them on me and peel them off, etc..
Basically it sound like you are headed in the right direction. You have to figure she would make strides slowly - if she was perfect about bonding from day 1 then I'd assume there was some underlying problem. I've heard of others mentioning the babies being afraid of Chinese people getting too close. It does make you wonder what her life has been like before now doesn't it? Hi Jaden! I love reading your blog and being able to share in part of your experience. The bonding and attachment stuff seems very normal. They are definitely going to have good and bad days. Your right, she is probably terribly confused and very sad. It definitely sounds as though she is making progress and forming attachments to both of you. It just takes time!!! Katie gave you some wonderful recommendations in terms of things to do to promote healthy attachment. Just hang in there. It is hard to know what each of these girls went through prior to their placement and each grieves so differently. Can't wait to meet her in person. She is absolutely darling!!! !